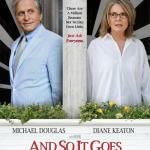 Michael Douglas and Diane Keeton are holders of Oscars and very deserved. They act perfectly, and even such the impression that they live in acting. They make a picture of own heroes on the screen something like the living inside of the acting and much brighter as is it done by those who do not have these gold-plated statuettes. A lot of cynical jokes and even direct insults in the film ("I've got more who likes me, so you can die right now"). Many such absurd morals that are completely out of place and thus, sound so amazingly funny. The story plays with the usual things of life – swearing, situations such as the temporary raising of their grandchildren and even clumsy attempts to flirt with someone who hates you initially. It would seem perfectly normal story. If not an acting of two main characters who are so finely felt this atmosphere in front of cameras that it seems that they do not play at all, but live. Whatever it was, you’ll get a great aesthetic pleasure from the view. It seems that from the budget in USD 18 million the most is spent on fees of star actors. At the box office, the film gained USD 25 million, paying off without bringing a lot of trouble to its creators, who did not had to worry about the material aspects of their profession.